Robert Rogers was a British Army officer and served during King Georges War, The French and Indian Wars, Pontiacs Rebellion and the American Revolution, made famous by the unit named after him; Rogers Rangers, he is considered by many to be the father of modern special forces and achieved great success by implementing backwoods and native skills to make raids deep behind enemy lines. Born in 1731 to Scots-Irish Settlers in Massachusetts Rogers and his family relocated to New Hampshire when he was eight. Hew Grew up near modern day Concord and by 1946 was a private in Captain Daniel Ladd's scouting company and later in Ebeneezer Eastman's scouting company and served along the New-Hampshire frontier during King Georges War. Later under the command of Colonel Wilmslow Rogers took charge of recruiting soldiers for the Crown after the commencement of the French and Indian Wars in 1755. He formed a force of 'rangers' soon to become known as Rogers Rangers and commanded them with considerable success. Rogers Rangers were the latest in a long line of New England ranger companies that had been active since the 1670’s. Rogers Rangers and their precursor Gorham’s Rangers, established 1744, were both active throughout the French and Indian Wars and were both originally established by a William Shirley, a British Administrator and Governor of Massachusetts, who in the face of mounting tensions between the British, French and Indians in the region established several volunteer militia companies including these and other ranger companies. Of all of these ranger companies though it was Rogers Rangers that are the most famous and Rogers himself who first codified what have become known as the ‘rules of ranging’. He wrote them and issued them to his rangers in 1959 while stationed on the Hudson and those rules have stood the test of time and have been adapted to modern day warfare and are still issued to and followed by US Army Ranger recruits today. All Rangers are to be subject to the rules and articles of war; to appear at roll-call every evening, on their own parade, equipped, each with a Firelock, sixty rounds of powder and ball, and a hatchet, at which time an officer from each company is to inspect the same, to see they are in order, so as to be ready on any emergency to march at a minute's warning; and before they are dismissed, the necessary guards are to be draughted, and scouts for the next day appointed. If you march over marshes or soft ground, change your position, and march abreast of each other to prevent the enemy from tracking you (as they would do if you marched in a single file) till you get over such ground, and then resume your former order, and march till it is quite dark before you encamp, which do, if possible, on a piece of ground which that may afford your sentries the advantage of seeing or hearing the enemy some considerable distance, keeping one half of your whole party awake alternately through the night. Some time before you come to the place you would reconnoitre, make a stand, and send one or two men in whom you can confide, to look out the best ground for making your observations. If you have the good fortune to take any prisoners, keep them separate, till they are examined, and in your return take a different route from that in which you went out, that you may the better discover any party in your rear, and have an opportunity, if their strength be superior to yours, to alter your course, or disperse, as circumstances may require. If you march in a large body of three or four hundred, with a design to attack the enemy, divide your party into three columns, each headed by a proper officer, and let those columns march in single files, the columns to the right and left keeping at twenty yards distance or more from that of the center, if the ground will admit, and let proper guards be kept in the front and rear, and suitable flanking parties at a due distance as before directed, with orders to halt on all eminences, to take a view of the surrounding ground, to prevent your being ambuscaded, and to notify the approach or retreat of the enemy, that proper dispositions may be made for attacking, defending, And if the enemy approach in your front on level ground, form a front of your three columns or main body with the advanced guard, keeping out your flanking parties, as if you were marching under the command of trusty officers, to prevent the enemy from pressing hard on either of your wings, or surrounding you, which is the usual method of the savages, if their number will admit of it, and be careful likewise to support and strengthen your rear-guard. If you are obliged to receive the enemy's fire, fall, or squat down, till it is over; then rise and discharge at them. If their main body is equal to yours, extend yourselves occasionally; but if superior, be careful to support and strengthen your flanking parties, to make them equal to theirs, that if possible you may repulse them to their main body, in which case push upon them with the greatest resolution with equal force in each flank and in the center, observing to keep at a due distance from each other, and advance from tree to tree, with one half of the party before the other ten or twelve yards. If the enemy push upon you, let your front fire and fall down, and then let your rear advance thro' them and do the like, by which time those who before were in front will be ready to discharge again, and repeat the same alternately, as occasion shall require; by this means you will keep up such a constant fire, that the enemy will not be able easily to break your order, or gain your ground. If you oblige the enemy to retreat, be careful, in your pursuit of them, to keep out your flanking parties, and prevent them from gaining eminences, or rising grounds, in which case they would perhaps be able to rally and repulse you in their turn. If you are obliged to retreat, let the front of your whole party fire and fall back, till the rear hath done the same, making for the best ground you can; by this means you will oblige the enemy to pursue you, if they do it at all, in the face of a constant fire. If the enemy is so superior that you are in danger of being surrounded by them, let the whole body disperse, and every one take a different road to the place of rendezvous appointed for that evening, which must every morning be altered and fixed for the evening ensuing, in order to bring the whole party, or as many of them as possible, together, after any separation that may happen in the day; but if you should happen to be actually surrounded, form yourselves into a square, or if in the woods, a circle is best, and, if possible, make a stand till the darkness of the night favours your escape. If your rear is attacked, the main body and flankers must face about to the right or left, as occasion shall require, and form themselves to oppose the enemy, as before directed; and the same method must be observed, if attacked in either of your flanks, by which means you will always make a rear of one of your flank-guards. If you determine to rally after a retreat, in order to make a fresh stand against the enemy, by all means endeavour to do it on the most rising ground you come at, which will give you greatly the advantage in point of situation, and enable you to repulse superior numbers. In general, when pushed upon by the enemy, reserve your fire till they approach very near, which will then put them into the greatest surprise and consternation, and give you an opportunity of rushing upon them with your hatchets and cutlasses to the better advantage. When you encamp at night, fix your sentries in such a manner as not to be relieved from the main body till morning, profound secrecy and silence being often of the last importance in these cases. Each sentry therefore should consist of six men, two of whom must be constantly alert, and when relieved by their fellows, it should be done without noise; and in case those on duty see or hear any thing, which alarms them, they are not to speak, but one of them is silently to retreat, and acquaint the commanding officer thereof, that proper dispositions may be made; and all occasional sentries should be fixed in like manner. At the first dawn of day, awake your whole detachment; that being the time when the savages choose to fall upon their enemies, you should by all means be in readiness to receive them. If the enemy should be discovered by your detachments in the morning, and their numbers are superior to yours, and a victory doubtful, you should not attack them till the evening, as then they will not know your numbers, and if you are repulsed, your retreat will be favoured by the darkness of the night. Before you leave your encampment, send out small parties to scout round it, to see if there be any appearance or track of an enemy that might have been near you during the night. When you stop for refreshment, choose some spring or rivulet if you can, and dispose your party so as not to be surprised, posting proper guards and sentries at a due distance, and let a small party waylay the path you came in, lest the enemy should be pursuing. If, in your return, you have to cross rivers, avoid the usual fords as much as possible, lest the enemy should have discovered, and be there expecting you. If you have to pass by lakes, keep at some distance from the edge of the water, lest, in case of an ambuscade or an attack from the enemy, when in that situation, your retreat should be cut off. If the enemy pursue your rear, take a circle till you come to your own tracks, and there form an ambush to receive them, and give them the first fire. When you return from a scout, and come near our forts, avoid the usual roads, and avenues thereto, lest the enemy should have headed you, and lay in ambush to receive you, when almost exhausted with fatigues. When you pursue any party that has been near our forts or encampments, follow not directly in their tracks, lest they should be discovered by their rear guards, who, at such a time, would be most alert; but endeavour, by a different route, to head and meet them in some narrow pass, or lay in ambush to receive them when and where they least expect it. If you are to embark in canoes, battoes, or otherwise, by water, choose the evening for the time of your embarkation, as you will then have the whole night before you, to pass undiscovered by any parties of the enemy, on hills, or other places, which command a prospect of the lake or river you are upon. In paddling or rowing, give orders that the boat or canoe next the sternmost, wait for her, and the third for the second, and the fourth for the third, and so on, to prevent separation, and that you may be ready to assist each other on any emergency. Appoint one man in each boat to look out for fires, on the adjacent shores, from the numbers and size of which you may form some judgment of the number that kindled them, and whether you are able to attack them or not. If you find the enemy encamped near the banks of a river or lake, which you imagine they will attempt to cross for their security upon being attacked, leave a detachment of your party on the opposite shore to receive them, while, with the remainder, you surprise them, having them between you and the lake or river. If you cannot satisfy yourself as to the enemy's number and strength, from their fire, conceal your boats at some distance, and ascertain their number by a reconnoitering party, when they embark, or march, in the morning, marking the course they steer, when you may pursue, ambush, and attack them, or let them pass, as prudence shall direct you. In general, however, that you may not be discovered by the enemy upon the lakes and rivers at a great distance, it is safest to lay by, with your boats and party concealed all day, without noise or shew; and to pursue your intended route by night; and whether you go by land or water, give out parole and countersigns, in order to know one another in the dark, and likewise appoint a station every man to repair to, in case of any accident that may separate you. There are many modern military outfits which claim direct descent from Rogers Rangers including The Queen's York Rangers of the Canadian Army, the U.S. Army Rangers, and the 1st Battalion 119th Field Artillery. Robert Rogers hero status for me doesn't necessarily come from his military victories though, and there is actually a fair bit of evidence that some of the claims of his success were exaggerated considerably, particularly the famous raid on St. Francis where conflicting reports offer estimates of between 30 and 200 enemy killed many of whom were women and children. Fort Crown Point, the starting point for the raid on St. Francis in modern day New York State. What is admirable about him was his skill as an outdoorsman and his ability to lead his men through difficult terrain with limited navigational equipment and to be to fight when he arrived. During the St. Francis Raid, probably the single thing Rogers Rangers are most well known for Rogers Rangers travelled for hundreds of miles at times with only the food they could forage, a few fungi, leaves berries, scraps of meat from beaver skins and even the boiled up leather of their own belts and pouches. What makes Rogers noteworthy even among his own men, who were a hardened and experienced group capable of incredible feats of endurance and possessed of incredible outdoor skill, is the way in which he travelled and moved his men. He was not a typical officer of the time and used irregular tactics and adapted very well to frontier life and campaigning. He used native skills and a sound knowledge of the land to move deep behind enemy lines where survival of large military formations used to the support of porters and supply companies would have been impossible. He and his men travelled light and relied on their knowledge rather than their equipment and they are examples to both military and civilians nowadays of fortitude and endurance. A skirmish fought against French and Indians in which Rogers troops were at an advantage due to their snow shoes while the french troop floundered in knee deep snow. 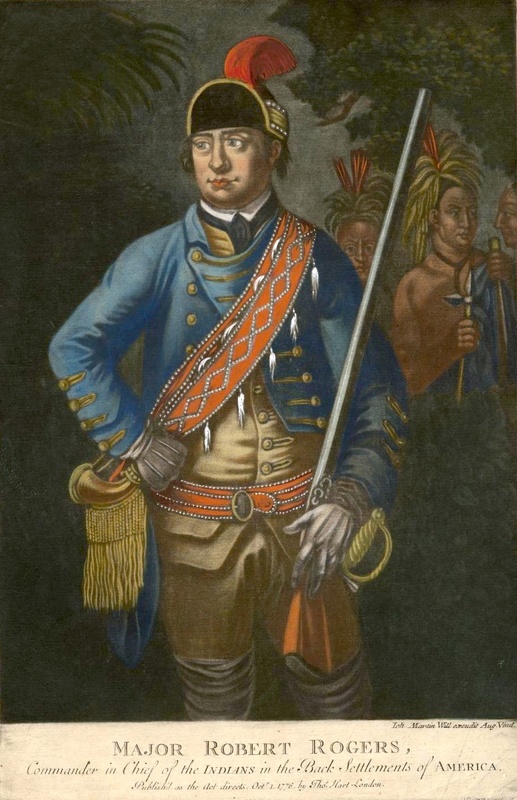 Famously, and inaccurately depicted in the book and film Last of The Mahicans by James Fennimore Cooper Rogers Rangers were present during some of the events of the siege, surrender and massacre at Fort William Henry. A defeat for Rogers and his rangers from which Rogers barely escaped with his life, he was reported killed as his jacket and commission papers were left at the scene of the skirmish and he was said to have slid four hundred feet to the frozen surface of lake George before escaping. His force of 180 was decimated by 700 French and Indian troops after he set out on a scouting mission and successfully ambushed a combined French, Indian party only to encounter a much larger party when they gave chase to their original targets. Most of the rangers were killed but a few including Rogers escaped. The British attack on what is now known as Fort Ticonderoga was a major military failure and one in which the Rangers took part, they opened the battle with the 80th Regiment of Light Armed Foot by pushing the French Skirmishers back behind their defences before the battle started in earnest. Rogers Rangers would latter participate in the Pontiac Rebellion and the Revolutionary War fighting for the British. His reputation as a leader of the rangers is now much greater than the sum of his modest military victories and he is remembered as a pioneering and influential soldier and commander as well as a great example of how frontier skill can be adapted to warfare.